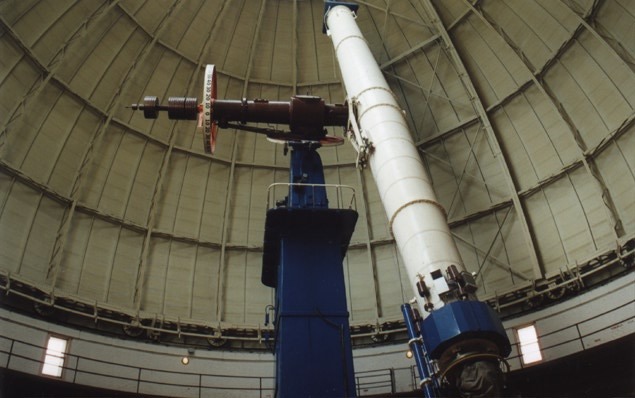 Eight members and one guest of the Kalamazoo Astronomical Society joined 20 members of the Capital Area Astronomy Club of East Lansing on a field trip to historic Yerkes Observatory in Williams Bay, Wisconsin on Saturday, August 19, 2000. This was somewhat of an anniversary trip, since the KAS took a trip to Yerkes almost 30 years ago to the day! 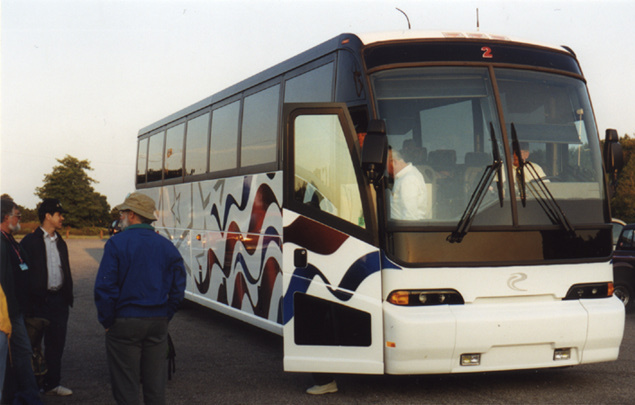 The adventure began at the Oakland Drive "Park & Ride" where the sleepy eyed members of the KAS gathered to meet the bus. Thanks to all our participants for arriving on time. The bus arrived at 7:20 a.m. We were amazed by the quality of the bus from Ground Transportation Specialists. It was very appropriately decorated with colorful stars (and stripes)! We were even more amazed when we boarded the bus, which was laid out inside much like a commercial airliner. It had roomy overhead compartments, a restroom, personal lighting, and closed circuit TV's throughout. We joked with the bus driver that all it lacked was a hot tub and lower level recreation room! Our luxury bus left the "Park & Ride" at exactly 7:30 a.m. We were on our way to Yerkes! Once everyone was settled in, Robert Miller welcomed us and distributed name badges. A continental breakfast of pastries and juice were then served. Jim, our speed racing bus driver, put the bus into hyperdrive and in no time at all we were at our first rest stop in northern Indiana. Then it was on to the Windy City and then a lunch stop in northern Illinois near the Wisconsin border. It struck us that Jim, our speedious bus driver, bore an uncanny resemblance to the late Dave Thomas, so we all got a chuckle when he pulled into a Wendy's. We tried to buy him lunch, but he told us it was taken care of. Hmm? Jim took the back way into Wisconsin (which he said was faster) and we were greeted at the border predictably by bovines, but happily not by a native welcoming party bearing cheese heads. Then it was a quick trip through Richmond and Lake Geneva to Williams Bay and finally Yerkes Observatory, which to our surprise is nestled in a neighborhood of modest homes. Yerkes is very impressive. It is located on a large tract of land in a park setting. It was built by the University of Chicago in the late 19th century with financial backing from Chicago transportation magnate Charles Tyson Yerkes. 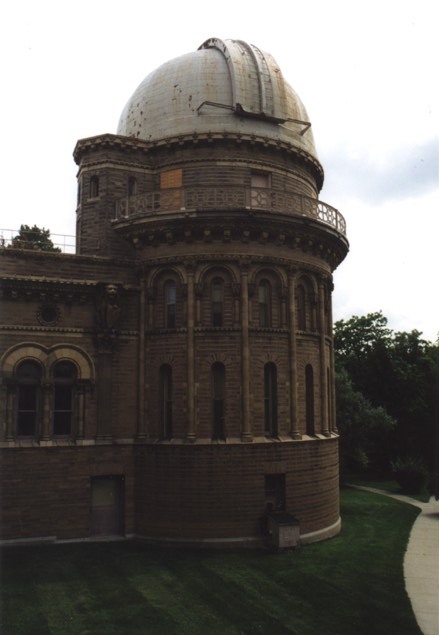 University of Chicago architect Henry Ives Cobb designed the observatory. 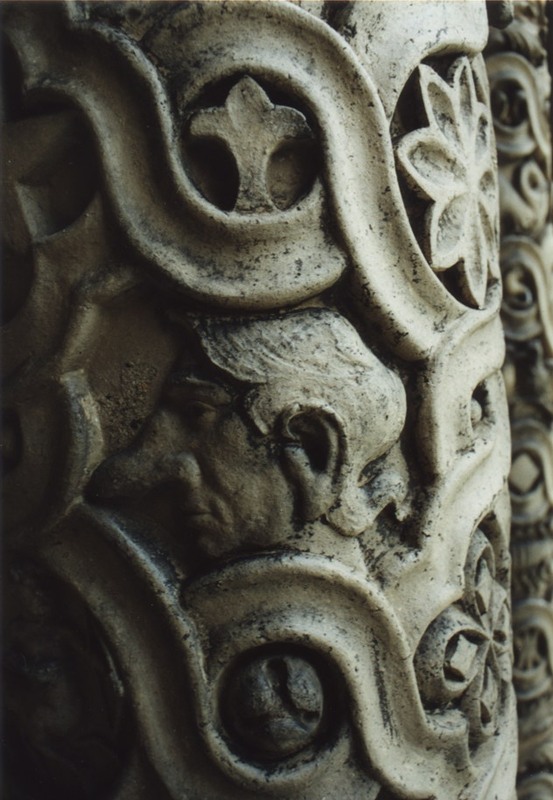 The architecture is Romanesque and highly ornamental, which was typical for the period. 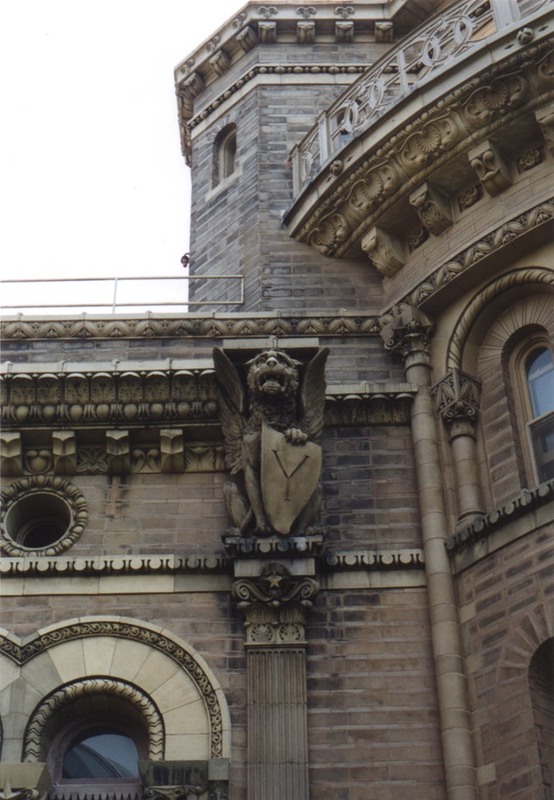 One could spend hours simply walking around the building studying the intricate stone carvings. George Ellery Hale, the first director of Yerkes, was the driving force behind the project and went on to build Palomar Observatory in California. 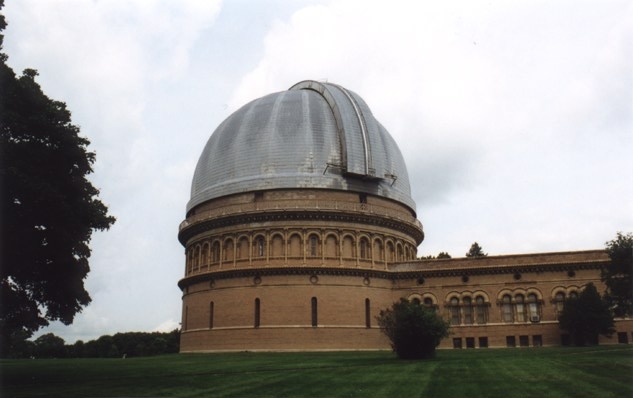 At the time of its construction and for many years afterward, Yerkes was at the pinnacle of astronomical research. Hale invented the spectroheliograph (an instrument for studying gases in the upper layers of the Sun) during his tenure and many solar discoveries were made using the 40" refractor. Gerald Kuiper, a giant in solar system research, discovered methane gas in Saturn's moon Titan and two new moons of Uranus. He also detected carbon dioxide in the atmosphere of Mars. The 105 year old refractor continues to gather important scientific data to this day. 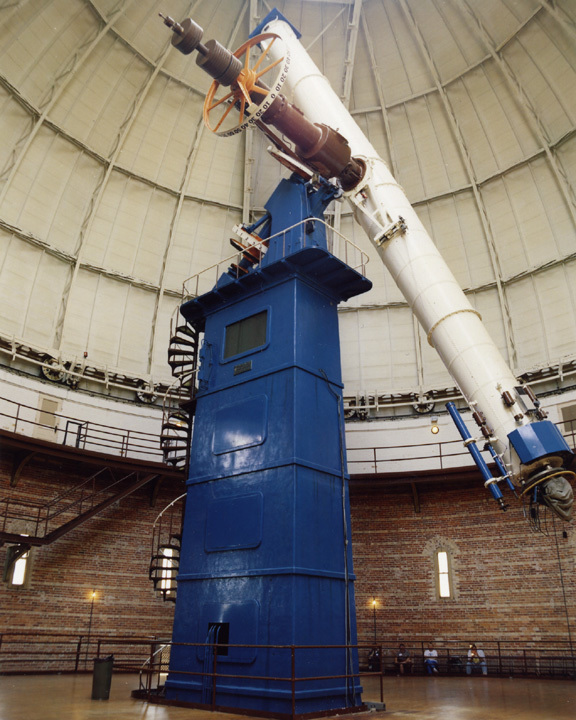 The crown jewel of the observatory is the 40" telescope, which today remains the largest refractor in the world. Weeks after joining the faculty at the University of Chicago, Hale learned that the University of Southern California had abandoned its project to build the world's largest telescope. The huge glass disks from France had been acquired by the optical company Alvan Clark and Sons, and they had already fashioned the disks into 40" lens blanks. The telescope itself was assembled by the manufacturing firm Warner and Swasey. They were also responsible for the construction of the telescope mount, 90' diameter dome to house the telescope, and a 73' diameter elevating floor that lifts astronomers to the telescope eyepiece. Our private tour began at 1:30 p.m. (CDT) on the front steps of the observatory. We wound up sharing our tour with 40 "planetarium hacks" from the Digistar Users Group on a field trip from their conference in Chicago. KAS member Eric Schreur was among them. Our tour guide was Richard Dreiser. After the introduction, the two groups went their separate ways. We were finally treading up the long flight of stairs for the highlight of our trip, seeing the historic 40" refractor first hand. Much to our disappointment, Richard evaded astronomy during his talk and continually wandered off the topic when he was asked specific technical questions about the telescope. We began to wonder if this was some guy they called in off the street to handle the overflow crowd. Despite the fact of a knowledgeable tour guide, we accomplished our mission. We saw the larger-than-life refractor. It was a fantastic sight to behold. The tour continued with a brief stop in the library. Mr. Dreiser showed us an astronomy book from the 1770's. Several members of the group made Mr. Dreiser an offer for the book, but he wouldn't sell! Our next stop was the dome containing the Warner & Swasey 40" Ritchey-Chrétien reflector (which is referred to as the 41" to avoid confusion with the great refractor). It was more than obvious why reflectors are the dominant telescope. 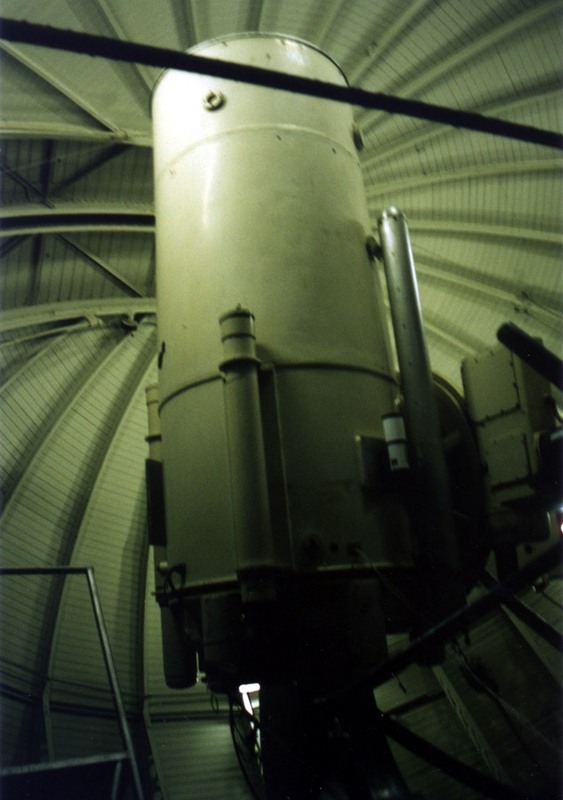 The 41" reflector was dwarfed by the 40" refractor even though they were the same aperture. This telescope is currently being used to test an adaptive optics system, called the Wavefront Control Experiment (WCE). It was at this point that our problem arose. As we headed down a spiral staircase to visit the 24" Boller & Chivens reflector, our tour guide changed his mind and took the first half of the group to the dome containing the 24" reflector. The problem was the other half of the group never heard about the change and was left hanging high and dry; they kept going to the original destination: the adaptive optics lab. Yerkes staff member Vivian Hoette showed the first half of the group the 24". 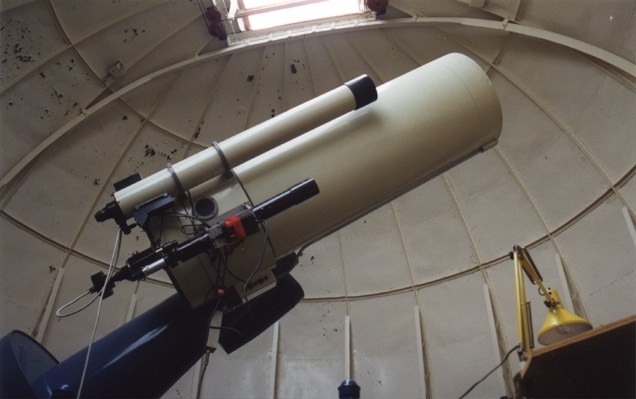 This telescope is currently being used in an educational program called Hands-on Universe. The other half of the group never got to see the 24" reflector and only a handful saw the adaptive optics lab. Then it was time for the long voyage home after our three and a half hour tour. Many of us did not want to leave. There was so much more to explore. The architecture of the building itself needed at least a full afternoon to survey. Oh well, we just have to plan another trip (maybe an overnighter next time!) As the sun set slowly in the west, Jim put the bus back into hyperdrive and sped us to Shoneys near the Wisconsin border for our evening repast. We then took the scenic route through Chicago and returned to Kalamazoo at 11:45 p.m. EDT. Tired, but happy!